What are the new Ready Pasta products that are being introduced? Barilla® is introducing Ready Pasta to provide an ultra-convenient pasta option to anyone who seeks a quick meal solution or snack. Barilla Ready Pasta is crafted with high quality semolina (wheat), durum wheat flour, extra virgin olive oil and sea salt for a perfect "al dente" texture and delicious flavor. Varieties include Penne, Elbows, Rotini and Gemelli. Ready Pasta will offer pasta consumers all the delicious taste and texture they have come to trust from Barilla in just 60 seconds. How do you prepare Ready Pasta? Each variety of Ready Pasta will have specific heating instructions on the back of the package. It is prepared differently than traditional pasta as it can either be microwaved for 60 seconds or warmed in a skillet with two teaspoons of olive oil for 2 to 4 minutes. Simply knead the pouch prior to opening, then follow the directions on the back of the package for the best results. What can I use Ready Pasta for? Ready Pasta is perfect for a quick lunch, dinner or snack! Ready in just 60 seconds, it’s great for a meal on the go, whether it be lunch at work, an after-school snack or an easy, delicious dinner at home. 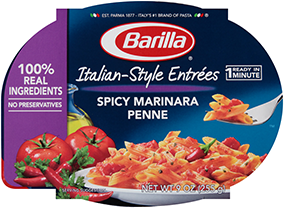 Does Barilla’s Ready Pasta taste like other Barilla pasta? The new Barilla Ready Pasta lives up to the quality standards that pasta lovers have come to expect from Barilla. Due to the difference in ingredients and heating process, Barilla Ready Pasta’s taste and texture may vary slightly from other Barilla pastas. For the best taste and texture, follow the heating instructions on the back of the package. What is the preparation difference between Ready Pasta and Blue Box Barilla Pasta? Ready Pasta is fully cooked pasta that can either be heated in the microwave for 60 seconds or in a skillet with two teaspoons of olive oil for 2 to 4 minutes. Both preparation processes achieve “al dente” perfection. For best results, follow the heating instructions on the back of the package. What is the preparation difference between Ready Pasta and Barilla Pronto? Ready Pasta is fully cooked pasta that can either be heated in the microwave for 60 seconds or in a skillet with two teaspoons of olive oil for 2 to 4 minutes. Barilla® Pronto® is placed in one pan, covered with cold water, then simply cooked over high heat until the water is absorbed, eliminating the need to pre-boil or drain. Both preparation processes achieve “al dente” perfection. For best results, follow the heating instructions on the back of the package. Can I eat Ready Pasta without heating? Yes, because Ready Pasta is already fully cooked but we don’t recommend it. Heating for 60 seconds in the microwave or in a skillet is recommended to bring the product to the optimal texture for eating. What if I forget to tear the pouch before microwaving? There is no problem if you forget to tear before microwaving, although the steam in the pouch will cause it to swell and possibly pop. If you forget to tear, it is recommended that you wait 2 minutes after heating to open to avoid the built-up steam in the pouch. Can I use Ready Pasta in a cold pasta salad? Absolutely, Ready Pasta is a convenient substitute to traditional Barilla dry pasta for any recipe. Although, we still do recommend you reheat the product according to the package direction even when adding to a recipe that calls for cold pasta. The reheating brings the pasta to optimal texture. Just allow a few minutes after heating for the pasta to cool down. Can I save some of the pasta for later? Yes, just make sure to refrigerate and use within 2 days. Do not use the pouch to reheat. Instead place the remaining pasta in a microwave safe bowl and reheat for 30-60 seconds. Can you freeze Ready Pasta? We recommend never to freeze the product while it’s still sealed in the original container as it does create more complexity to thaw it and eat it at your convenience. The product tastes best when it is stored in a dry place. Can I eat right out of the pouch? Yes, you can. Gently knead the pouch to separate pasta. However, we recommend heating it to enjoy the product. To make an authentic Italian meal, we recommend adding two teaspoons of olive oil, salt and pepper to taste, finished with a sprinkle of Parmigiano-Reggiano cheese. Is Barilla Ready Pasta nutritious? Is it better for you than other Barilla products? Barilla Ready Pasta is considered a natural part of the internationally acclaimed Mediterranean diet, an eating pattern that is considered by nutritionists to be one of the world’s healthiest ways to eat. The diet was recommended by the 2015 Dietary Guidelines for Americans as a pattern that can help promote health and prevent disease. Pasta tossed with other healthy ingredients, such as vegetables, beans, lean proteins, olive oil and herbs, is an easy way to follow a balanced Mediterranean-style Diet. Barilla Ready Pasta is just as nutritious as Barilla’s other traditional semolina pastas. It can be the perfect foundation of a nutritious meal and a regular part of a well-balanced diet. Incorporating a variety of quality food groups into the diet in reasonable quantities is a great way to get all nutrients the body needs. Is Barilla Ready Pasta gluten free? Barilla’s Ready Pasta is made up of high-quality, non-GMO ingredients and contains no preservatives; however, it is not gluten free. Barilla’s Gluten Free pastas provide an enjoyable way to enjoy pasta for those seeking a gluten free diet or who have gluten sensitivities. Does Barilla Ready Pasta contain preservatives? No. Barilla Ready Pasta does not contain preservatives. Is the Ready Pasta packaging made without BPA? The Barilla Ready Pasta is made without BPA. Our package is produced without the intentional addition of BPA.